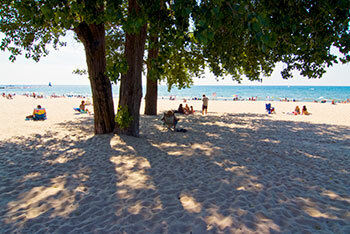 Welcome to Ludington and our Beautiful Lake Michigan Beaches! Ludington is centrally located on the West Michigan lakeshore along the route of the Lake Michigan Circle Tour. This scenic harbor town is home port to the S.S. Badger Carferry, which crosses Lake Michigan daily during May-October. With Ludington situated at approximately the half way point along the Circle Tour, a carferry cruise across Lake Michigan provides a relaxing short cut for those who aren't able to complete the entire circle in one trip. Far removed from the hustle and bustle of the big cities - with Lake Michigan as our backdrop - you'll find the kind of town people want to visit and many call home. Welcome to Ludington, Michigan, a vacation paradise and a wonderful place to live. There are so many Ludington beaches to discover! You'll find miles of clean, sandy beaches along Lake Michigan and Hamlin Lake, just minutes from wherever you are in the area. Stearns Park is the most popular beach, with FREE parking, concessions, playground, Skate Park, mini golf, and shuffleboard. Whether you enjoy swimming, skiing, tubing, boating, or fishing--Ludington's beaches and lakes provide hours of relaxing enjoyment and exhilarating adventure. That's right! Two Ludington lighthouses to discover! These beautiful and historic structures are an integral part of our community. The North Breakwater Light is in downtown Ludington at the end of Ludington Avenue and the Big Sable Point Lighthouse is within the Ludington State Park just north of town. In addition to the two lighthouses in Ludington, if you venture 30 miles north or south you'll find Manistee's North Pierhead Lighthouse and Little Sable Point Lighthouse in the Silver Lake State Park. Most lighthouses are open for tours in the summertime, offering a glimpse into Great Lakes maritime history. Anglers from all over know that Ludington is the #1 salmon port on Lake Michigan. Numerous Ludington charter captains have years of experience on the big lake and are eager to take you on a fishing excursion. Check out our current and archived Fishing Reports for Lake Michigan charter fishing. Ludington area inland lakes are wonderful for fishing as well. Hamlin Lake is full of northern pike, bass, perch, and bluegill--or ice fish in the winter for panfish and walleye. 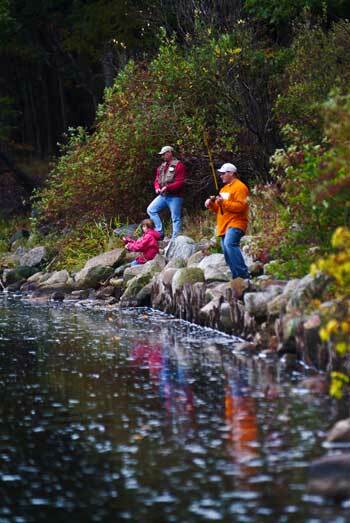 There's also great fishing in nearby Pere Marquette Lake and the Pere Marquette River. Midwest Living magazine voted the Ludington State Park the #1 state park in the Midwest, with seven miles of Lake Michigan shoreline. Enjoy camping, boating, fishing, swimming--or hike on one of eight marked trails that wind through the park and bring you face to face with nature's beauty. 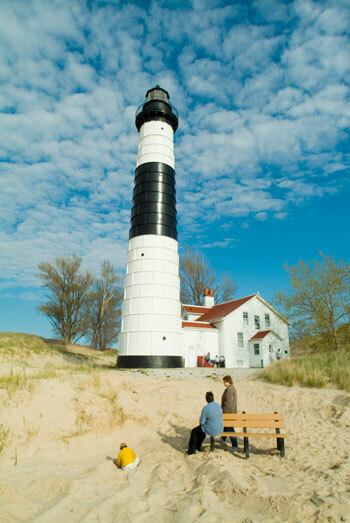 Two highlights of the Ludington State Park are the Hamlin Lake Dam and the Big Sable Point Lighthouse. While you're at the Lake Michigan Beach be sure to visit the Beach House for concessions and a great view...or head over to Hamlin Beach and rent a canoe, kayak, paddleboard or paddle boat for hours of fun. 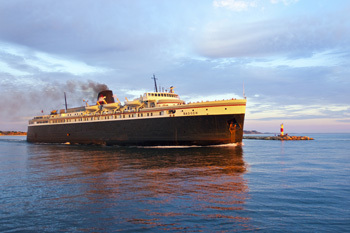 Ludington is the home port of the largest carferry to sail the Great Lakes. The S.S. Badger carferry makes its voyage from Ludington to Manitowoc, Wisconsin mid-May to mid-October. This 410' ship carries up to 620 passengers and 180 vehicles. Onboard you can play Badger Bingo, watch a movie, shop, or enjoy a meal in one of their two restaurants. Kid's activities include a video arcade, coloring contests, and playroom. The best part of the journey is sitting on deck and enjoying the view--including spectacular sunsets. The S.S. Badger is on the National Register of Historic Places. Read about the best places to watch the carferry sail and helpful hints when arriving by the carferry. Any season--any time--Ludington is where you want to be. We have listed our area events in our festivals & events story so you can see at a glance what's happening when. You can get event details by checking our calendar of events pages and selecting a specific month. There's always something fun going on, no matter what time of year. You'll never be bored in Ludington! Explore VisitLudington.com for more information! When you visit a community away from home, it's typical to find yourself eating out, shopping, or looking for things to do. Ludington merchants are happy to serve you with a smile! So, browse at our specialty stores in downtown Ludington or nearby. Relax, and enjoy a meal at a local restaurant. Discover the many businesses ready to entertain you, or to provide you with a variety of services. Ludington is along the route of the Lake Michigan Circle Tour.